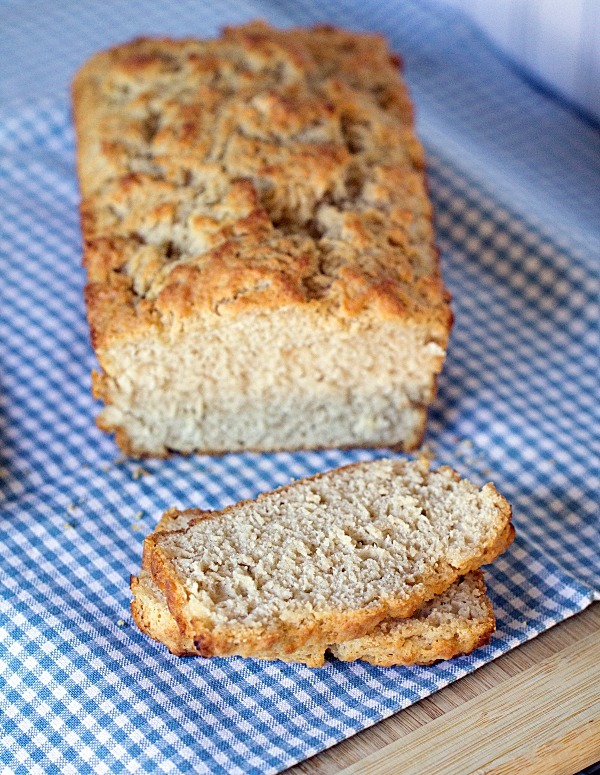 This no knead Beer Batter Bread is a full on comfort food. 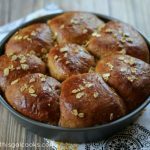 The beer makes this bread savory delicious while the melted butter drizzled over top keeps it delightfully moist and soft. I’m not going to lie. 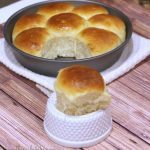 This Beer Batter Bread was addictive. I probably ate 3-4 pieces right after I made it. And then I ate a few more the next day. And then the next. You get the picture right? I’m a breadaholic. Hence the reason I have decided to go on a bread fast for a bit. Well, I’d call it a carb fast. If you missed my Chocolate Chip Peanut Butter Banana Muffin post, check it out. Not only will you get delicious muffins, you’ll get to read about my attempt on becoming a Super Rad Running Girl/Carb Blaster super hero. A couple months ago, Ken went out of town for work. He was gone for four days. When you go out of town for work, you end up eating restaurant food for breakfast, lunch and dinner. You live and breathe restaurant food. Now I’ve had some good restaurant food but the really good stuff is usually a little pricy. And we all know that the boss gal or boss man gives us a limit on what we can spend for our meals. So fancy food while out of town for work doesn’t always happen. Although, it did happen one night while I was out of town for work. Mmmm. Fancy salmon over pearled couscous. Yum. Anyways, I decided to be super girlfriend and make a good ole home cooked meal the day Ken came back from his business trip. I made Super Simple Crockpot Roast Beef, Mashed Potatoes and this bread. A fabulous dinner, I must say. 1 12 oz bottle of beer. I used UFO Pumpkin Beer. 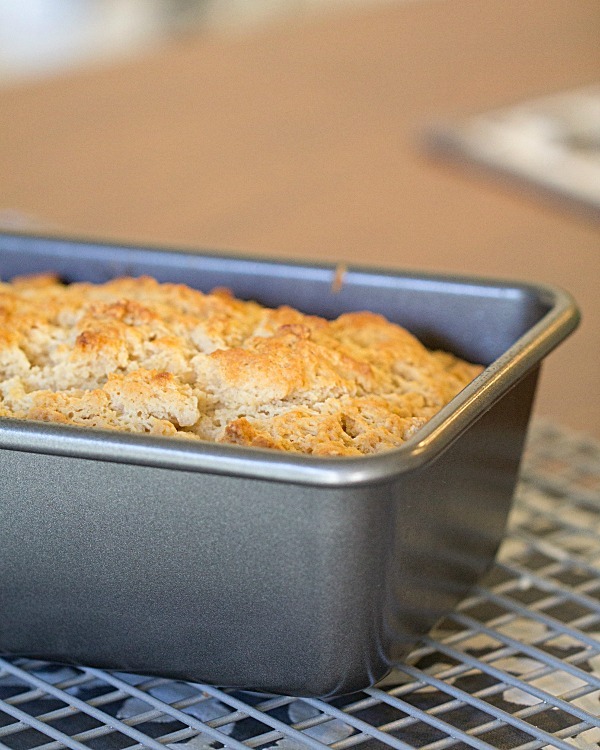 Grease a 9x5 loaf pan. In a mixing bowl, stir together the flour, brown sugar, baking powder and salt. Add the beer and stir until the batter is combined and slightly lumpy. Pour the batter into the loaf pan and drizzle the top with the melted butter. Bake at 375 for 35-40 minutes. This bread looks moist and delicious! Julie- Your bread looks delicious! I have not cooked with beer; does this have a strong beer taste? Hi Joanne! Thank you. :) The bread does not have a strong beer taste. To me, the beer just gives it a deeper flavor. It definitely doesn’t taste anything like drinking a glass of beer. I have a serious carb issue too Julie and this bread might not help because it looks so delicious!! Hope you are having a great weekend! 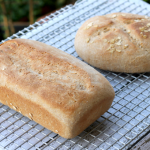 Yummy bread and so easy to make. I am new to pinterest and found your site and have pinned a ton of your recipes. My husband thanks you also. A friend made this and gave me the URL to this recipe. The bread is warm and fluffy, almost biscuit like, soft inside with a hard, bumpy crust. It does not taste like beer, but had a deep bread flavor that goes well with butter and is very satisfying. I found my self nibbling while unsetting the table. This was a huge hit. Very good, very good with our autumn feast of turkey, stuffing, root veggies, asian slaw, mashed red and sweet potatoes, cranberries and pomegranate seeds, plum tarte, and chocolate pie with whipped cream and ice cream. Very yummy.